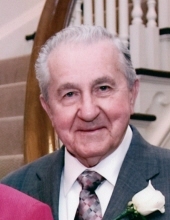 On April 9th, 2019, Edward (Ed) Richard Huber, loving husband, father and grandfather, passed away at the age of 91 with his family at his side. Ed was born in Detroit, Michigan, to Victoria and Henry Huber just before the Great Depression. As a child, Ed enjoyed playing guitar, fixing cars and collecting stamps and coins. Ed served in the US Army’s 82nd Airborne after WWII, just prior to the Korean conflict. When he returned home from service he worked in the Huber Garage in Dearborn (owned by his father, now long since paved over by Ford Road). Ed studied mechanical engineering, earning his BS degree from Lawrence Tech. He worked as an engineer at Ford Motor Company until his retirement in 1993. Ed worked in Ford’s Parts & Service Division for many years. While working at Ford, Ed would take his family on month long road trips each year to see much of the US and Canada. Ed loved traveling and his children could all claim to have visited nearly every state in the country during their childhood. Ed had four children with his first wife, Catherine (nee Chisholm) - Chris Huber, Cathy Forman, Rich Huber (Rachel) and Margie Criner (David). His children will remember Ed as a dear father and someone they could depend on for support, advice and guidance throughout their lives. After Catherine passed away in 1980, Ed met Patricia Murrin and thus began a great love story that would last the rest of his lifetime. Pat and Ed were married in 1983. Pat had four children from her first marriage to John Murrin who had also passed away - Suzanne Murrin (John Jost), John Murrin (Lisa), Katie Frey (Frank) and Maureen Lathrop (Patrick). Pat and Ed most enjoyed watching their grandchildren grow up. Ed was a wonderful grandfather to his grandkids and had all the time in the world for them. He taught them to fish, build snowmen and enjoy life. Pat and Ed loved hosting friends and family at their home. They also loved traveling, mainly to Atlantic City and Las Vegas —searching for that ever-elusive jackpot, but really just enjoying each other’s company the whole time. On one trip to California, Ed tried gold panning with his friend, Tom Marshall, and was immediately hooked. It was the joy of the hunt that Ed loved. Even if the payoff didn’t make him rich, Ed loved it all the same. Ed was a very accomplished artist whose work adorns many family members’ walls. His artwork has also been displayed on many a float in the St. Patrick’s Day Parade through the years. Ed played golf, racquetball, enjoyed boating, fishing and of course stamp collecting during his long and happy life. Ed is survived by his wife Patricia, his children, and 10 grandchildren. He was preceded in death by his sister Lorrain Frescura. The Huber and Murrin families would like to especially thank Ed’s caregivers at Comfort Keepers and Hospice of Michigan for their wonderful support during Ed’s final months. Visitation will be held at Lynch & Sons Funeral Home, 404 E. Liberty St. on Thursday, April 11th, 2019 from 3 - 8pm. Funeral Service at St. Mary’s Catholic Church, 1955 E Commerce St, Milford, MI 48381, on Friday, April 12th, 2019 at 11 AM with gathering beginning at 10:30AM. Interment will take place at Holy Sepulchre Cemetery. Memorial Contributions can be made to The Capuchin Kitchen or The Knights of Equity. "Email Address" would like to share the life celebration of Edward Richard Huber. Click on the "link" to go to share a favorite memory or leave a condolence message for the family.